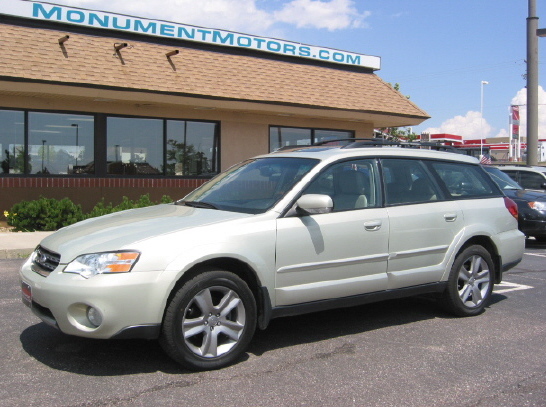 2007 Outback 2.5i LLBean at Monument Motors, your source for used Subaru Outbacks near Colorado Springs, Castle Rock & Denver. Local, one owner Colorado car. Outback 2.5i LLBean with SportShift automatic transmission (autostick), 2.5 liter SOHC boxer engine, factory NAVIGATION, heated tan cloth seats, heated mirrors & windshield, side-impact & side-curtain airbags, premium am/fm/satellite/MP3/WMA stereo with in-dash 6CD changer & auxiliary jack, alloy wheels, newer premium winter tires, remote keyless entry, alarm, auto-dimming mirror with compass & HomeLink, center console armrest extension, cabin air filtration, cargo cover and cargo mat. (The original Factory MSRP on this Outback 2.5i LLBean was approximately $28,000.) This Subaru qualifies for a 3year or +45,000mile Extended Service Plan at an additional cost. Sample picture. JUST SERVICED AND NEW: updated HEAD GASKETS, head bolts, valve cover gaskets, intake & exhaust manifold gaskets, throttle body gasket, TIMING BELT, tensioner, 3 idler pulleys, cam seals & front crankshaft seal, resealed oil pump & new o-ring, rear crankshaft seal, rear oil separator plate, water pump, thermostat & gasket, upper & lower radiator hoses, fresh coolant, spark plug tube seals, spark plugs, spark plug wires, drive belts, engine oil & filter, air filter, cabin air filter and new windshield. The front brakes are good with only 50% wear, and the rear brakes at 40% wear. The head gaskets & valve cover gaskets are now dry, and no oil or coolant leaks. PLEASE CALL FOR ADDITIONAL DETAILS & DISCOUNTED PRICING.